A VIEW ON RUSSIA. | SNinternational. 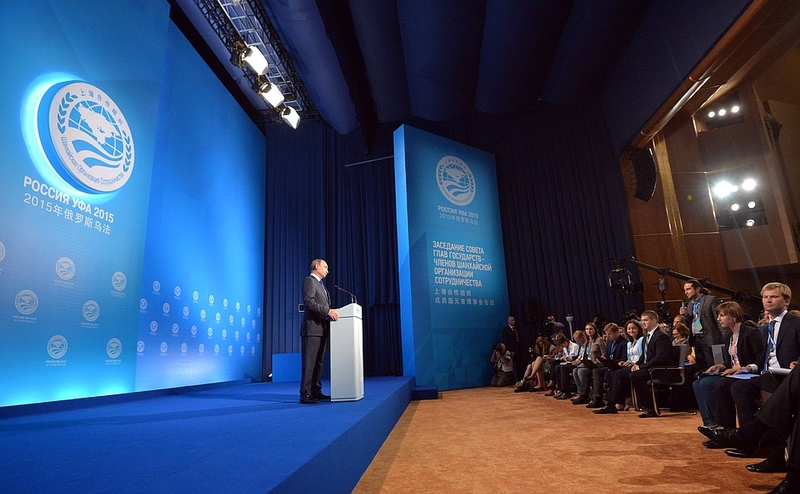 Vladimir Putin gave a news conference following the BRICS and Shanghai Cooperation Organisation summits in Ufa. Why do the mainstream media not cover these events? Here is your chance to get info on what recently took place in recent times what we should be paying attention to. They have also created a Freeport Status to Vladivostok! to improve economy of the area and boost trade with east! ( if we are not careful the West will get left behind) Russia may have many faults however the WEst is not perfect either we need to be more constructive with politics and stop letting the elite control the world and seed to subdue it under a globalised dictatorship. Vladimir Putin: Good afternoon, ladies and gentlemen. Let me start by giving a brief summary of the results of the BRICS and SCO summits that took place here in Ufa. They concluded Russia’s presidency in these two influential organisations and represent a big step in developing our countries’ multifaceted cooperation. In terms of their influence and scale, the BRICS and SCO summits figure among the important foreign policy events on the international agenda. The heads of 15 countries, representing several different continents – Eurasia, South America, and Africa – came to Ufa. Each of these countries has its own development road, economic growth model, and rich history and culture. It is this diversity and coming together of different traditions that gives the BRICS group and the SCO their strength and tremendous potential. We held meetings and talks in a wide variety of formats over these three days in Ufa. Both summits included meetings of heads of state and government in narrow and expanded format, as well as an informal joint meeting of the BRICS and SCO leaders, together with the leaders of the Eurasian Economic Union’s member countries, who were also invited to Ufa. Essentially, you could say that we had three organisations meeting here – BRICS, the SCO, and the Eurasian Economic Union. We also had many bilateral meetings. I had 11 bilateral meetings, for example, and also talks with the President of China and the President of Mongolia together. Now, I still have another two meetings – with the President of Afghanistan and the Prime Minister of Pakistan. Yesterday, I had the chance to speak with journalists in detail about the results of the BRICS summit, and so I will just note the most important points now. The key documents that were approved by the BRICS leaders – the Ufa Declaration, the plan of action and the Economic Partnership Strategy – contain concrete agreements on the development of our association and the consolidation of its international status, and provide for comprehensive measures to deepen our coordination in foreign policy, and expand mutual trade, investment and technology exchange. We have opened the door to the practical operation of BRICS financial institutions – the New Development Bank and Contingent Reserve Arrangement, with a total capacity of $200 billion. We have agreed with our BRICS partners that, before the year’s end, a special roadmap will be developed for major collaborative projects in infrastructure, industry and agriculture. We have agreed on the further expansion of the humanitarian elements of our interaction, the engagement of civil society members. To make our group’s activity more transparent and open, we decided to launch a special website – the BRICS virtual secretariat. As the summit is rounding up, Russia’s presidency is not yet over. Until next February when the presidency will be passed to India, we will continue building up cooperation within the group. Now let me say a few words about the SCO Heads of State Council Meeting. We discussed current issues and the outcome of Russia’s presidency in details. The major goals set last year have been achieved. First of all, for the first time in the 15 years of the SCO, the decision was made to increase the number of members. We signed documents to begin the accession of India and Pakistan. Therefore, the SCO’s capabilities to react to modern threats and challenges will grow. The organisation’s political and economic potential will significantly expand. A resolution was made to upgrade the status of Belarus to an observer. Armenia, Azerbaijan, Cambodia and Nepal have become dialogue partners. Several more states have expressed willingness to join as observers and dialogue partners. The geography is rather impressive – from South and Southeast Asia to the Middle East. I would like to stress that the summit has passed the SCO Development Strategy that outlines the priority areas until 2025. They include priorities in all major areas of cooperation – from creating conditions to boost collaboration in trade and the economy to ensuring regional stability and prompt responses to conflicts and crises. We have adopted the Ufa Declaration. The declaration describes general approaches to the most relevant international and regional problems and gives an assessment of the organisation’s day-to-day activity. We also had an in-depth discussion of the situation in Afghanistan. We noted that ISIS had stepped up its activities and spread its tentacles to that country, which elevates the security threats on the southern borders of the Shanghai Cooperation Organisation. We believe it’s important, without procrastinating, to go ahead and implement the summit-approved Programme of Cooperation in the Fight Against Terrorism and Separatism for 2016–2018, and to start drafting the SCO Convention on Combating Extremism. It is no secret that drug money is a major source of funding for radical terrorist groups; therefore, the SCO members have outlined plans to counter the drug threat. These plans are incorporated in a special Statement of the summit. The newly adopted Border Cooperation Agreement is designed to curb drug trafficking as well. We agreed to expand economic activities within the SCO, and make better use of the capacity created within the Business Council, the Energy Club and the Interbank Consortium. I would like to take this opportunity and invite the representatives of the SCO Member States, primarily, the business community, to participate in the East Economic Forum, which will be held in Vladivostok in September for the first time. We plan to expand cooperation in the sphere of education and tourism within the SCO. The SCO University uniting 69 universities is already functioning. A programme to promote tourism and the Youth Council are actively working as well. Notably, at the summit, we adopted a statement of the Heads of State on the occasion of the 70th anniversary of victory in World War II. It is important to remember the human lives lost during the fight against Nazism, and oppose attempts to distort historical truth and promote radical ideas. Starting tomorrow, the SCO presidency will go to Uzbekistan. I’m confident that our Uzbek colleagues will fill the agenda with promising and meaningful initiatives. Please join me in sincerely wishing every success to our Uzbek friends. We are willing to provide them with as much assistance in their work as they might need. Ladies and gentlemen, we believe that not only did we manage to fill the SCO and BRICS summits with substantive negotiations and important decisions. The organisational work was also good. A lot of credit for this goes, of course, to Bashkortostan’s leaders and Ufa authorities, as well as all the residents of this republic and its capital. I would like to thank them for their hospitality and genuine desire to create a comfortable environment for all the participants of these two major international forums. Question: Anton Vernitsky, Channel One. BRICS countries are facing problems due to a number of reasons, including political and economic problems in Brazil, economic problems in Russia, and a stock market crash in China. Do you see a way out of this situation? What can we do? Do you see a future in BRICS? Will this association, which is in fact an informal club, become a full-scale international organisation? Vladimir Putin: All countries have economic problems. According to forecasts made by international financial organisations, they predict a downslide. Recently, the IMF – or was it the World Bank? – has forecast a decline in global economic development. Everyone knows what is happening in Europe: an economic slowdown and a Eurozone crisis over Greece. The growth rate in the United States has slowed too, and it’s a well-known fact that its sovereign debt is larger than its GDP. If memory serves, its GDP equals US$ 17.8 trillion, and its sovereign debt has reached US$ 18.2 trillion. This is a serious problem not only for the United States but also for the global economy. In this sense, the BRICS countries are no exception; unfortunately, they are part of the global economic trend. As for Brazil, its problems are mostly rooted in the economy. I think that our Brazilian colleagues know they need to reorient themselves toward new development incentives and to resume growth. As always happens in the world, the opposition is using these difficulties to their advantage – this is one of the “golden” rules of the political stage. I believe, and have no doubt, that Brazil will overcome these problems and resume a path of sustainable development. Regarding China and its stock markets, we discussed this issue with the Chinese President. Chinese authorities are not overly concerned, and I agree with the Chinese point of view that “bulls” have been acting too confidently – even overconfidently – and now we are seeing a downward correction. The recent data show that there has been a minor rise, so there is nothing unusual about this situation. I think that China will remain a global economic driver. I don’t need to tell you about what is happening in Russia. As I have said more than once, we have some problems, and the growth rate, including the GDP, has dropped. On the other hand, we have maintained our reserves, an acceptable ruble rate, and a trade surplus. Considering our economic foundations, there are grounds to believe that we will overcome these problems. As for whether BRICS will become an organisation, you know that BRICS originated in 2005, when we proposed a meeting between the leaders of China, Russia, and India, who was attending the St Petersburg forum among outreach participants. They accepted our proposal, we met, and later we held a special meeting as a group. Brazil joined us later, and South Africa followed suit in 2009, I think. It was a natural process; no one was forced into it. This is extremely important, because all members of this process sense an objective need for cooperation. This, in particular, concerns the need to create more democratic principles for the global economy. Mutual assistance is also important. This is why we have created the new Development Bank and the Contingent Reserve Arrangement, each of them worth $200 billion. Our cooperation instruments are already taking shape. This is important. Do we need a bureaucratic structure? I don’t think there is any need for it right now. To be able to better coordinate our cooperation, as I said, we will create a virtual or electronic secretariat. Question: Good afternoon, I’m Olga Skobeyeva from the Rossiya television network. As we can see, the BRICS countries have decided not to expand for the time being, whereas the SCO has launched the process of accepting new members. How much will the SCO expand in your opinion? Won’t its unity disappear with the accession of new members? Vladimir Putin: I understand your question and the logic that more members will make it harder for the SCO to reach consensus. All issues are decided by consensus in the Shanghai Cooperation Organisation. We do not operate like a bloc and nobody imposes any decisions on anyone. All decisions are taken unanimously. Consensus among many countries, especially neighbours that have many objective questions for each other and often a complicated historical background, is what makes our decisions so strong. We are making complex, meticulous and lengthy but joint efforts on the road to common decisions. If we arrive at them, stability is guaranteed. Question: Who else will join the Shanghai Cooperation Organisation? Vladimir Putin: It is too early to speak about this. We have decided to start the process of approving full membership for India and Pakistan. We all know the background of relations between these two countries. We are hoping that the SCO will become an additional venue for finding compromises and solutions on disputed issues. We know that Iran also wants to join and we are considering this possibility. As I said, other countries are very interested but for the time being we must deal with full membership for India and Pakistan. This process has just been officially launched. We must first complete it and then decide what to do next. Question: Kira Latukhina from Rossiyskaya Gazeta. Mr Putin, after your talks with the Chinese leader in May you promised to focus on seeking points of convergence between the Eurasian Economic Union (to which Russia devotes significant attention) and the Chinese project for a Silk Road Economic Belt. Was this issue discussed at the summits and what is the practical importance of this initiative? Vladimir Putin: Yes, this issue was discussed and in different formats – both at limited attendance and expanded meetings, if you noticed. I don’t remember when exactly the journalists left the hall and when they were present. Anyway, we discussed this issue in different formats and we believe that these two projects are compatible and not contradictory. Moreover, our colleagues in the SCO and BRICS often talk about the need to develop infrastructure without which it is impossible to ensure sustainable development. This applies to railways, roads, air transport and pipelines. It is hard to dispute this. Meanwhile, the Silk Road Economic Belt projects and our plans for the development of Tran-Siberian Railway and the Baikal-Amur Railway and some of our other projects in the EAEU obviously require joint efforts. We are actively discussing ways of doing this and I’m confident we’ll find them. Question: Ilona Rudneva, RIA Novosti. Mr Putin, I have a question about Iran for you. Talks on the Iranian nuclear issue are underway in Vienna. The Group of Six is optimistic and looking forward to achieving a speedy settlement. What do you think about this? Are you optimistic in this regard? Also, how detailed were your discussions about the nuclear programme during your talks with President Rouhani? My last question is also about Iran – could you please state your position on the possible lifting of sanctions on Iran. Won’t it lead to a collapse in oil prices? Vladimir Putin: Regarding talks on the Iranian nuclear issue, of course, we discussed it yesterday with President Rouhani. Almost all foreign ministers are now in Vienna, except our minister, but he reassured us yesterday that we are on top of the negotiations process. On a more serious note, we really are aware of what is going on there, and our minister is in touch with his partners and colleagues in Vienna. We participate actively in this process. I hope that soon it will come to completion with the signing of the necessary documents and coordination of guarantees which, I believe, are extremely important: first, in terms of international security and the non-proliferation of weapons of mass destruction. In this sense, not only Iran and the participants of the negotiation process are the stakeholders, but also all of the countries in the region, including Arab countries and Israel. Second, of course, we operate on the premise that Iran will see all of the sanctions lifted. The question is when, what particular sanctions, and so on. We are in favour of the comprehensive lifting of the sanctions as soon as possible, as we believe that sanctions are an inadequate approach to resolving international issues and problems. However, all negotiation partners have their own perspectives on this issue. There must be a compromise. In my opinion, it will be achieved soon. At the same time, Iran will, of course, boost its oil production, but this is also a natural process. We believe that a tool such as sanctions should no longer be a part of international economic relations, or international relations in general. It should not be used in the global economy, as it turns it upside down. We all must live in a normal and natural environment. Only this will allow us to ensure sustainable, stable and safe development. Regarding the increase of oil production, yes, this is possible. The global economy will adapt. What I mean is that the consumption will, of course, grow. The same applies to the Russian economy. We are absolutely ready for this. Question: Kseniya Golovanova, Interfax. Mr Putin, did you manage to discuss the situation in Ukraine with your colleagues from the SCO and BRICS? If so, did you see them support Russian approaches to resolving this crisis? I would also like to hear your assessment of the current situation in Ukraine. Don’t you think that the settlement is treading water? Vladimir Putin: I’ll start with your last point. I do think that to a certain extent the settlement is stalling due to the fact that our partners in Kiev are not willing to negotiate directly with Lugansk and Donetsk. It looks a bit strange, as precisely our partners from Kiev insisted on the Donetsk and Lugansk leaders showing up in Minsk and signing these documents. They did come to Minsk and signed the documents, stating that they are prepared to comply. What we see now is that Kiev does not want to talk with them directly. Why then ask them to come and sign the documents? It is strange, to say the least. We will take it as a tactical ploy. I am more inclined to believe that we have better chances to succeed than fail. This is my first point. Second, with regard to whether we discussed this issue or not – some of our colleagues asked us about Ukraine without going too deep into the issue, and we gave them our vision of the situation the way that we see it. This issue is incorporated in the final documents as well. However, we all agree on one thing – there is no way to resolve the Ukraine crisis other than peacefully by fully and unconditionally complying with the Minsk agreements. Question: Darya Stanislavets, RIA Novosti, Prime. Greece is going through a serious crisis. It has not yet reached an agreement with its creditors. You met with Mr Tsipras [Greek Prime Minister Alexis Tsipras] in St Petersburg and spoke to him on the telephone after the referendum. Did Athens ask Russia for financial assistance? Did Russia promise such assistance? Is Russia able and willing to provide such assistance given its own economic difficulties? Could such assistance be provided, for example, by the New Development Bank? Also, what do you personally think about the Greek creditors’ proposals? If you were in Mr Tsipras’s shoes, would you accept or reject them? Vladimir Putin: Russia of course can provide assistance to its partners no matter what. Despite Russia’s economic difficulties, the fundamentals of our economic situation today are such that we are in a position to do this. What’s more, we do provide it to certain countries. Regarding Greece, we have a special relationship of spiritual kinship and religious and historical affinity with it. However, Greece is an EU country, and within the bounds of its obligations, it is conducting rather complicated negotiations with its partners in united Europe. Mr Tsipras has not asked us for any assistance. This is only natural, because the figures are too high. We know what is on the table, and fundamental decisions have to be taken. This is not even a matter of money. It is a matter of economic development principles and the principles of resolving these problems with their partners in the foreseeable future. We have already said – I have said it in public – that of course the Greeks can be blamed for everything but if they committed violations, where was the European Commission? Why did it not correct the activity of previous Greek governments? Why did they grant bonuses and loans? Why did they allow it to keep such a low profile on taxation in certain sectors of the economy? Why were there such big subsidies for the islands? And so on and so forth. Where were they earlier? So, there is something to discuss, and the Greek government has something to argue about. Furthermore, when one powerful currency is used in a number of countries with different levels of economic development, then the country is unable to regulate either its finances or its economic situation via currency mechanisms. Greece cannot devalue the euro, can it? It’s impossible. It does not have this tool or the possibility of drawing more tourists, while tourism is one of Greece’s principal industries – in the context of its obligations within the Schengen zone. It has to limit its agricultural production because it has to stay within the quotas set by Brussels, and it has to limit fishing and many other things. In other words, there are limitations but there are also advantages in EU membership, related to soft loans, bonuses and so on. This, however, is the sovereign choice of the Greek leadership and the Greek people. This does not directly affect us but indirectly, of course, it affects all of Europe and Russia, despite the fact that we are not an EU member, because we have extensive trade and economic ties with Europe, while Europe is our number one trade and economic partner. Naturally, we are watching this very closely and with a certain measure of anxiety, but we still hope that the crisis will be resolved in the very near future. Question: Xinhua news agency, China. Russia is currently pursuing a strategy to develop Siberia and the Far East. What steps is the Russian Government taking to implement this strategy? And how do you see China’s role in the development of this region? Vladimir Putin: The Russian Government has adopted a number of decisions aimed at creating favourable conditions for doing business in these regions. We are talking about creating areas of accelerated development and offering certain incentives to economic actors. We are talking about reducing taxes on so-called greenfield projects – I am referring to facilities that start from scratch. We are discussing a number of other preferences and benefits to be granted to companies that are going to start doing business in the eastern parts of the country, such as, for example, building free ports, and so on and so forth. In the near future (as I said in my opening remarks), we intend to organise an economic summit for the first time in the Far East, and I have informed our colleagues from China. We invite Chinese businesses to participate in this forum and we will give you the details on all the opportunities that are opening up in the Far East. I think that Chinese companies could participate and make a significant contribution to attaining the goals that we set for ourselves in the region – to their advantage, of course. Question: Mr Putin, Vesti-Bashkortostan, the local affiliate of VGTRK state broadcasting company. You said in your opening remarks that you appreciated the preparations. I take that as a positive assessment. Does this mean that the Republic of Bashkortostan, Ufa is capable of hosting international events, and not necessarily political ones? Could it be a sporting event in the future? Vladimir Putin: Of course, if you have hosted two major international forums such as the SCO and BRICS summits, with a large number of guests, and media representatives, why not? I know that in the run-up to these summits in Bashkortostan, the local authorities did more than improve the road infrastructure and create an excellent work space they also built several hotels. How many? Vladimir Putin: Seven high-end international hotels built. Everything has been arranged to host major events here. We will continue consultations and contacts with the leadership of the republic and think about it, maybe bring in sports and other activities, possibly political events, these could be repeated as well. Question: Lifenews TV Channel. Mr Putin, at the meeting with the Indian Prime Minister, you promised to try out yoga. Have you done this yet? Maybe you can already tell us about your achievements. Vladimir Putin: Yoga implies development from the physical aspect to the spiritual one. Let’s say I have started with the spiritual aspect so far, but I still have to cover a lot of ground. Here’s a young woman raising her hand. Please, ask me your final question. Remark: Roxolana Chernoba, Rare Lands magazine. Question: What will the world be like in 10 to 20 years in the context of the current agreements? Will we have BRICS bank cards, or BRICS passports? What should we expect in a decade? What languages should our children study? As for financial instruments, we must launch our plastic cards on a full scale this year and make them accessible to our citizens. We must have them not only in Russia but also abroad, like some other countries are gradually doing; for instance, Japan and China. I’m sure we’ll do this 100 per cent. We have a vast market. But what have we done? Visa and MasterCard are used by 97 per cent of the people in Russia. Is this normal? Not at all, but we allowed our partners to do this proceeding from the premise that the economy is outside politics. But it happened that this is not the case. The economy is immersed in politics and, moreover, being used as an instrument of political struggle. So we’ll have to draw conclusions from this. I have said many times that this does not mean that we must surround ourselves by some wall. This won’t happen. We’ll use all instruments of cooperation with all countries, including the United States and European and Asian states. Naturally, we’ll primarily develop relations with those countries that want to cooperate with us. The BRICS countries want to do this. They are powerful states with a strategic prospect of development. They are leaders – the future leaders of the world and the global economy. Look at their human and natural resources and potential; look at their growth rates. So I’m confident that new instruments of cooperation will appear. They will have a favourable influence on the citizens of our countries and we’ll live in a world that will be more balanced, more safe and prosperous. ONLINE REAL OR SCAM HOW DO YOU TELL DIFFERENCE ?